Following the failure of TNReady on Day One, Commissioner Candice McQueen announced a simple solution: Tests will now be administered on pencil and paper. Except, it turns out, it’s not so simple. What if the paper tests don’t arrive on time? Dickson County Schools have delayed administering the paper version of the state’s new TN Ready standardized tests until March 7 after a delay in receiving the testing materials, the schools director said. Schools Director Dr. Danny Weeks alerted parents to the issue in a SchoolReach phone message and he also discussed the matter with the county School Board on Thursday night. Educators and parents had prepared for administering the paper tests on Monday. However, Weeks said the school system had not yet received confirmation the print testing materials had yet shipped Thursday. The ongoing saga of the TNReady challenges reminds me of the time the legislature pulled Tennessee out of PARCC just as we were preparing to have our first year with the Common Core aligned tests. Instead of a year without a test, we administered another year of TCAP — a test not aligned with our state’s current standards, and thus not an accurate indicator of student mastery or teacher impact. Governor Haslam and Commissioner McQueen have announced that teachers and students alike won’t be held accountable for test results this year, but what about just taking the year off and getting it right? NOTE: Below is a guest post by Dr. Sharon Roberts, Chief Operating Officer, State Collaborative on Reforming Education (SCORE). There has been a lot of discussion recently about how to improve our schools and increase student achievement, and it can often be tough to cut through the chatter and identify the smartest solutions. But right now, Tennessee has a clear path forward that is easy to see. Superintendents from 114 of the state’s 141 school districts have signed letters asking their state legislators not to change Tennessee’s academic standards during this legislative session. The letters echo the findings of SCORE’s 2014-15 State of Education in Tennessee report, which identified moving ahead with updated assessments and stability for the standards as the top priority for the coming year. It’s not often that we see this much alignment from such a diverse group – representing small rural districts, large cities, and communities of sizes in between. The leaders that signed these letters represent districts that educate about 85 percent of all Tennessee public school students. When we have this many voices speaking together, it is important to respectfully listen to what they are saying. The great majority of Tennessee school district leaders – the people who witness every day how our academic standards are working in classrooms – want to keep those standards unchanged this year and let the current process to review and refine our standards play out. On the heels of these superintendents and directors of schools speaking out, we heard from community college presidents who agree. They know that in recent years about 68 percent of students entering community college have needed to take remedial classes to get prepared for college-level work and that a stronger foundation in K-12 means success in post high school credentialing and work. They are working diligently to help Tennessee achieve the bold goals of the Drive to 55. That’s why they, too, asked policymakers to maintain the existing standards that are helping strengthen students’ skills. Superintendents, college presidents, and educators we talk to across the state agree that providing a stable environment to move ahead is the best thing we can do for Tennessee students this year. The urge to take bold action during the legislative session can be strong, especially when it comes to setting our kids up for success. But this year, educators and many others believe that the strongest leadership our leaders can provide is to hold off on major changes and give our teachers, students, and parents some stability while they implement the student-focused policies that have already been put in place. While there is no need for legislative action, I do urge other Tennesseans – especially teachers – to take action by taking the time to review our English language arts and math standards and provide feedback on what’s working and what can be improved. That’s the best way to ensure our state standards will work in Tennessee classrooms. You can visit www.tn.gov/standardsreview to see what the standards look like and offer your own thoughts. The decisions we make today will impact an entire generation of Tennesseans. We all want to make sure that our students are on the path to success in college, careers, and wherever life takes them. Right now, our policymakers can keep students on that path by rejecting proposals to start over or to go back and committing to gathering thoughtful input and building on the strong foundation that is already in place, and that is paying dividends for our students. Dr. Sharon Roberts oversees SCORE’s organizational operations and project management to further the organization’s mission, vision, and strategic plan. She is also heavily involved in SCORE’s outreach program, targeting and engaging stakeholders across the state. Prior to joining SCORE, Dr. Roberts entire career was spent as an educator, beginning as a special education teacher in the Grainger County School System, spending 21 years in Knox County School system as a teacher, instructional coach, principal and assistant superintendent, and then becoming Director of the Lebanon (TN) Special School District. The Tennessee Organization of School Superintendents (TOSS) released a letter yesterday urging the General Assembly to support the Common Core State Standards as they are rather than delaying their full implementation and developing new standards. Legislation has been filed that would lead to the creation of new Tennessee Standards and delay testing aligned to those standards until the 2017-2018 academic year. The leaders who signed the letter represent school districts that are educating more than 850,000 students, or nearly 86 percent of public school students in Tennessee. The letter points out that in the past seven years Tennessee’s K12 education system has undergone significant changes that have led to unprecedented progress in the quality of education that students receive. statewide assessment aligned to Tennessee’s State Standards, is introduced. “The superintendents who signed these letters believe the input from those closest to the classroom should be valued and more of it should be gathered through the online review,” Kingsport City Schools Superintendent Dr.
the work and interest of the superintendency, gathering and circulating information on general school matters, and providing pertinent information on sound education legislation to the General Assembly. TOSS also proposes and analyzes legislation that impacts local school systems. 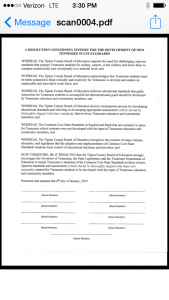 The Tipton County Board of Education passed a resolution last week calling on the Tennessee General Assembly to repeal the Common Core State Standards and replace them with Tennessee Standards that ensure students are prepared for college, career, and/or the military. 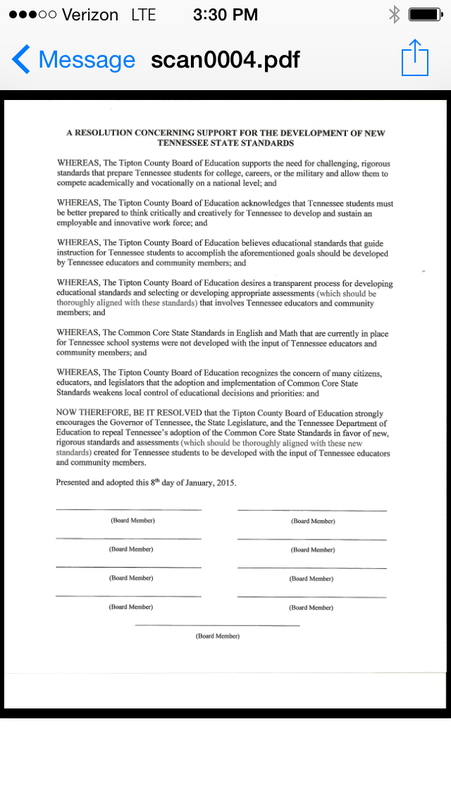 The resolution notes that the Common Core Standards, currently guiding Tennessee schools, were developed without input from Tennessee educators. The Board is asking the state to develop its own standards and include Tennessee educators in the process. Governor Haslam has essentially promised the same thing, calling for a review of the Common Core and the development and implementation of Tennessee standards developed with input from a group of Tennessee educators.